The annual Grand Isle Migratory Bird Celebration takes place Friday to Sunday, April 12, 13, 14, 2019 throughout the town of Grand Isle. 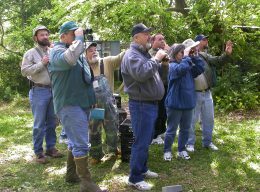 See songbirds in oak-hackberry woods, shorebirds and waders on beaches and in the marshes and raptors overhead. 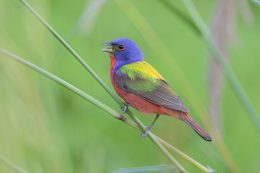 Grand Isle is an essential stop for songbirds during their spring and fall migrations across the Gulf of Mexico. The celebration is held annually to correspond with peak bird migration in April. Last year, 168 different bird species were identified during the three-day event. Highlights of this year’s event include daily, expert-led bird watching tours on the Grand Isle Birding Trail, Elmer’s Island and the Grand Isle State Park. Visitors can watch the Louisiana Department of Wildlife and Fisheries catch migrating songbirds for weighing and measuring before release in Lafitte Woods Preserve and later tour the new LDWF Fisheries Research Lab. Kayak tours through the island’s mangroves and boat tours to pelican-rookery Queen Bess Island will also be offered as well as walking tours of the island’s historical homes. This Annual Celebration Event, initiated in 1998, was created in part to support the purchase and management of the Grand Isle Sanctuary to protect some of the last remaining undeveloped chenier habitats (live oak ridges). The event is hosted by the Grand Isle Sanctuary Group, Grand Isle Community Development Team, Town of Grand Isle, The Louisiana Nature Conservancy and Barataria-Terrebonne National Estuary Program.